From the opening of this movie, you realise something is wrong. Not the introduction of the movie’s villain, who is fairly decent and has some good development later in the movie, but more the reintroduction to three of The Enterprise’s principle crew, Kirk, Spock and “Bones” McCoy. 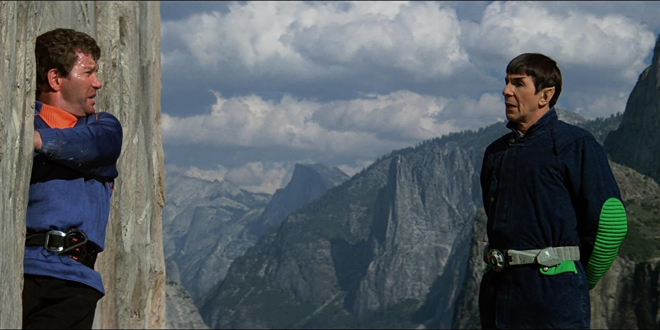 The movie begins with Kirk climbing El Capitan, without safety gear, while Bones looks on in horror. Kirk falls and before he hits the ground in a William Shatner puddle, he is saved by Spock who flies to his rescue with rocket boots. It is a cringey, ill-conceived and far too comical opening which sets the tone for what is a bizarre installment in the Star Trek movie franchise. It is a shame because the overall idea has promise. This begins with a very good villain. Laurence Luckinbill is Sybok, a rejected Vulcan who didn’t give-up emotions but embraced them, being able to see and “cure” people of their fears. It makes for some great moments, particularly when he begins to use his “power” on the crew of The Enterprise. One scene which stands-out involves DeForest Kelley’s McCoy, fleshing-out his character more than ever before and really testing the actor’s ability, which luckily he matches. The familial connection of the villain to Spock makes for a decent, potential story-line, while The Final Frontier of the title is a location, one which could be seen as paradise or heaven. All of these are ingredients for a movie with a good story, an effective villain and some potential drama. Unfortunately, it is all lost in the final execution. The revelation of what is on the “other side,” what secrets are held at The Final Frontier, is disappointing, under-whelming and worst of all, confusing! It is never properly explained who the villain really is or what the finale of the movie means. It becomes a mix of flashes, explosions and the cast jumping around. Add to this the awful effects. 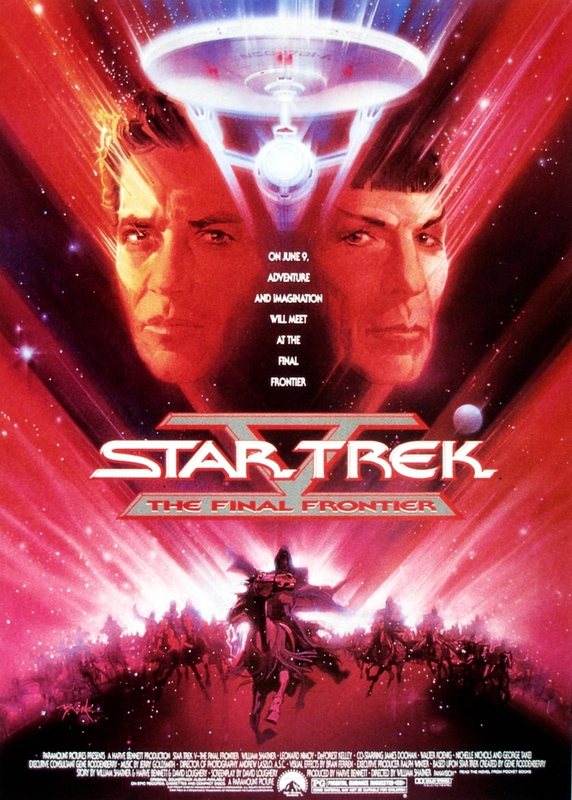 There is no excuse for this as The Final Frontier is a movie made in 1989! Previous films in the series have delivered some effective visuals which look fantastic and have really sold the story. This movie gives us a big face, balls of light and a strange “God-like” figure. It loses it’s effectiveness because the special effects are so poor. It isn’t just the finale, the whole movie is delivered in a really average, almost rushed way. It doesn’t have any lasting-effects, like the events of Wrath of Khan or The Search for Spock. It also finishes in a really cheesy way, under-cutting any of the drama which is worked so hard to develop. Overall, Star Trek: The Final Frontier should probably have been exactly that. It is one of the weakest installments in the series, wasting an effective villain, some excellent dramatic moments and a finale which could have matched some great potential. Instead we get a confused villain, awful visuals and a movie which becomes cheesy and silly.